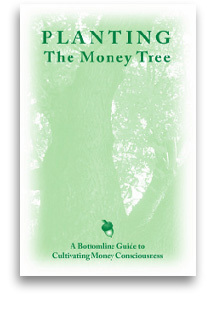 Plant a Money Tree - Harvest Prosperity! Buy the book & download now! Are you experiencing lack and limitation in your life? The Harvest Meditation can help you get back on the path to prosperity. Need a Quick Pick-Me-Up? The Prosperity Prayer will uplift you now! Who says money doesn't grow on trees...it's made of paper right? Money. We are all so worried about making it and spending it, but what does money really give us? Sense of Security, Freedom, Power, Happiness? Aren't those things that money cannot buy? Money is representative of your time, energy, intellect, and luck, but it is really none of those things, and if you are not clear, money can drain you of your time, talent, and energy and leave a pretty empty hole in it's place. But we need money to survive! And we want to do better than "just get by." We want to support ourselves, our families, and our dreams...we want to thrive! O.K., so money is not the root of all evil. We like money. We want more of it. So what do we do? Plant a Money Tree of course! Right! If it were that simple, everyone would do it. Simple? Yes! The only reason everyone doesn't do it is because they don't know how to activate the Prosperity Principles. These principles are like mathematics. Everyone is able to add and subtract, but simply knowing the principles doesn't balance your checkbook...but putting them into action does! Do You Know the Prosperity Principles and How to make them work for you? Most people don't! Most people think that riches come to those who are Lucky or even worse, Ruthless. It's true that sucessful people have something different than the rest of us, but it isn't luck or lack of honesty. If that were true, casino's would make people rich, and prisons would be full of millionaires!